Is Naquee Ahmed another innocent Muslim youth in his early twenties to be unfairly detained, tortured and charged with terrorist links? Or, is he a terrorist or a terrorist in-the-making? 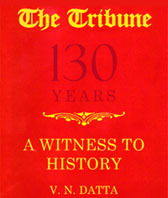 The answer is not forthcoming from either the Special Cell of the Delhi Police, which reportedly used the young man to identify culprits believed to have planted bombs in Zaveri Bazaar in Mumbai (July, 2011), or the Anti-Terror Squad (ATS) of the Mumbai Police, which picked him up in Mumbai on January 9 and formally arrested him the next day. The Shiromani Akali Dal (SAD) today released a please-all election manifesto, focusing especially on the youth and women. Vowing to continue all existing schemes for the economically weaker sections, party chief Sukhbir Singh Badal said the scope of such welfare schemes would be enhanced. 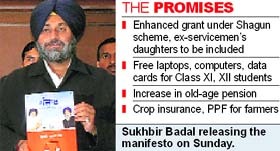 The Shiromani Akali Dal (SAD) today released its manifesto, promising something for everybody. Specially targeting the youth, unemployed, weaker sections and women, the manifesto promises to continue with the welfare schemes. �The objective is to ensure that the benefits reach the needy and promises don�t remain on paper�, said SAD president Sukhbir Badal. With over 1.3 million personnel, the Indian Army is considered to be among the world's largest armed forces and has many challenges to face. 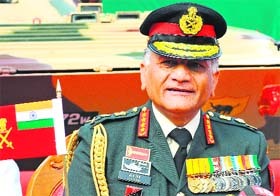 Vijay Kumar Singh, the Chief of Army Staff, in his statutory complaint to the Union Government on August 26, 2011 outlines some of them in the first paragraph. The Salman Rushdie row refused to blow over today with the controversial author slamming the Rajasthan Police for "inventing" a threat to his life to keep him away from the Jaipur Literature Festival. The state government dismissed the charge saying Intelligence Bureau had given the inputs and it was not concocted. Even as the fraternity of writers remained divided over Rushdie issue, an almost stampede-like situation diverted the attention of around 20,000 people who descended on Diggi Palace on Sunday morning. They waited in queues for hours for security check, not to defend freedom of expression, but to have a glimpse of Oprah Winfrey, arguably the most popular media personality in the world. Barrister Aitzaz Ahsan agreed to represent Prime Minister Yousuf Raza Gilani for a token fee of Rs 100, but put tough conditions before he agreed to plead for Gilani in the contempt of court case before the Supreme Court. Foremost of the conditions was to keep at bay people who had engaged in �uncouth� criticism of the judiciary and the judges. The Barrister was clearly referring to PM Gilani�s earlier counsel and former law minister Babar Awan.